This fragment is my contribution to the wealth of literature about Germany’s most mysterious mountaintop, the Brocken. Most mentions include depictions of the witches’ revelry on Walpurgisnacht, such as in Goethe’s “Faust,” but I didn’t see any witches myself. Just a bunch of tourists stumbling through the freezing fog. 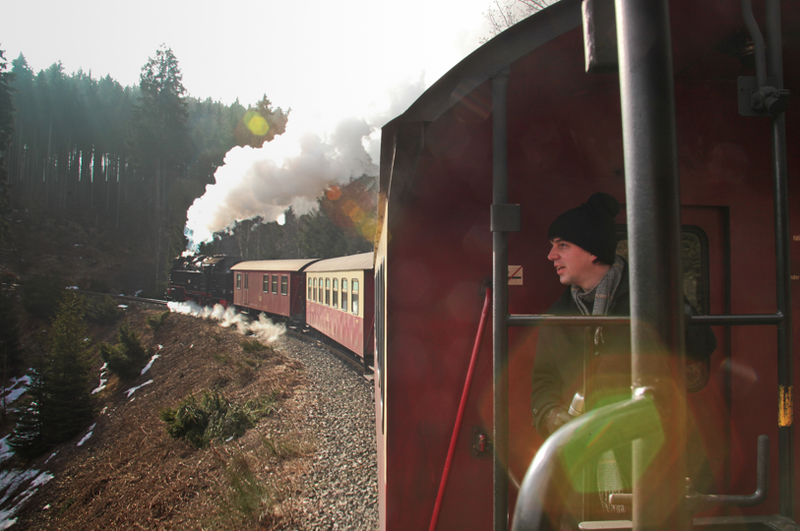 Jenn and I decided to visit the peak on my 30th birthday, ascending via narrow-gauge steam railway, a 19 km ride from Wernigerode that took almost two hours. Most of the journey offered clear views of the surroundings, but when we got to the top we found we couldn’t see anything. The red-and-white television tower — home of a Soviet spy station in the cold war times — was almost completely hidden from view, which was amusing considering you can usually see the thing from dozens of miles away. Instead of scenes from Goethe’s Faust, I reflected on Thomas Mann’s “Doktor Faustus,” which I finished reading last month. The book contains very little overt occultism, instead raising some disturbing questions about the artistic process. Must one really sell one’s soul to complete a work of true genius? Such is the case for Mann’s composer character Adrian, whose speech at the end is so tragic and ridiculous it makes the preceding 500 pages well worth it. Me? I’d rather be a minor poet, slugging Hasseroder Pils from the platform of the rickety old train, speeding toward a dinner of farmer’s potatoes and bacon in a cosy restaurant near the town’s famous rathaus. Thanks everyone for the kind birthday wishes (especially Private Cho calling from the Korean Border!) and I will be in touch with more e-mails and posts soon. In the meantime, you can see more pictures of the journey here.